When booking a public beach or park we are not responsible for inclement weather. While rain is unlikely, no guarantees about weather conditions or beach erosion can be made. No covered back-up location is available when you book a beach wedding. If you are concerned about rain we strongly recommend a semi-private venue to assure a "plan B" in case of rain. Fortunately we know of a few fine, reasonably priced venues in Maui. When you arrive at your public beach location, it is first come first served. It is a serious breach of etiquette to ask other beach goers to move from their spot because you would like to be married there. We can always move to a different spot on the beach that is just as nice. Asking people to move is a violation of state rules and may result in the loss of our license to operate. Alcohol, chairs, arches, tiki torches, amplified music, and fake flowers are all illegal props for a beach wedding. Maximum number of people allowed at a beach wedding is 30 including vendors. All private venue prices are subject to change without notice. 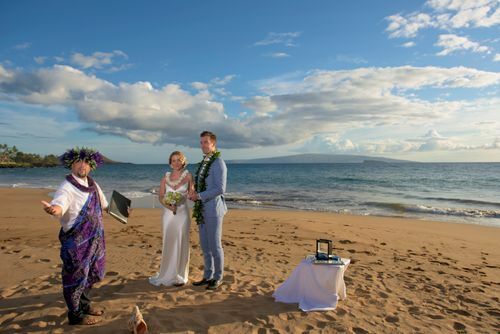 To insure superior service and satisfaction, all vendors and services must be booked through Marry Me Maui Wedding Planners.